A few months ago I was struck by the number of posts floating around that discuss digital marketing “fails,” and blogger outreach gone bad—so many posts that just focused on what not to do. While these posts are important, educational, and often very funny I had trouble finding positive examples of PR professionals going above and beyond when it came to blogger outreach. I interviewed bloggers who had phenomenal experiences with PR pros and compiled this post. The story that stood out the most and gave me the warmest and fuzziest feeling was Scott Thomas’s example of how well Char-Broil treats him and how well they run their blogger outreach campaigns. Naturally, I wanted to know more. I talked to Mary Eitel of MKE Communications who handles Char-Broil’s outreach efforts to get her take and advice on blogger outreach. So, from a paragraph to a post—here is a more in depth look at what makes Char-Broil so awesome and effective at blogger outreach. Maybe you won’t be filled with the warm and fuzzies. but there is plenty to learn here. Enjoy! Char-Broil’s All-Star program has been evolving for the last three years and involves working with some of the best outdoor cooking bloggers. Keep in mind that “the best” is subjective and different for every brand. I’ll get in to that and Mary’s take a little further in the post. They’ve found a handful of bloggers who write about outdoor cooking and have fostered relationships with them that result in authentic coverage. The bloggers offer original content for Char-Broil’s community site but also weave product mentions organically into their other content, resulting in the most sincere and positive recommendations possible on the digital web—word of mouth. Char-Broil stays engaged with their network by sending them grills to use, inviting bloggers to post on Char-Broil’s site (cross promotion), and keeping everyone updated with company news and exclusive information. Mary explained that when Char-Broil initially began looking for bloggers for their All-Star program they had big plans to be very methodical about the process. They set target goals such as Klout score and traffic. This is one of many key takeaways from Char-Broil’s strategy—place an emphasis on quality and a snug niche fit instead of numbers. Now, Mary and Char-Broil have made the very smart and mature transition to contextual qualifiers when choosing bloggers to connect with. Will this blogger’s content interest their readers? Is the blogger a good writer? Is the content accurate and well-written? Are the bloggers actively posting? Organic search. She spends a lot of time each day reading blogs that are related to outdoor cooking, barbecue, tailgating, etc. She checks out the bloggers who are commenting or sharing on Char-Broil’s social channels. They always pay attention to the bloggers that their All-Stars are following and take in to consideration people that they recommend. After following the blogs for a while, Mary sends an initial email that introduces Char-Broil and their All-Star program. The email is friendly, brief, and she simply asks the blogger if they’d like to discuss collaboration with a follow up phone call (I love this personal addition). When the blogger is compatible with Char-Broil’s brand and the two parties form a relationship, the bloggers are compensated through a combination of free product and cash. 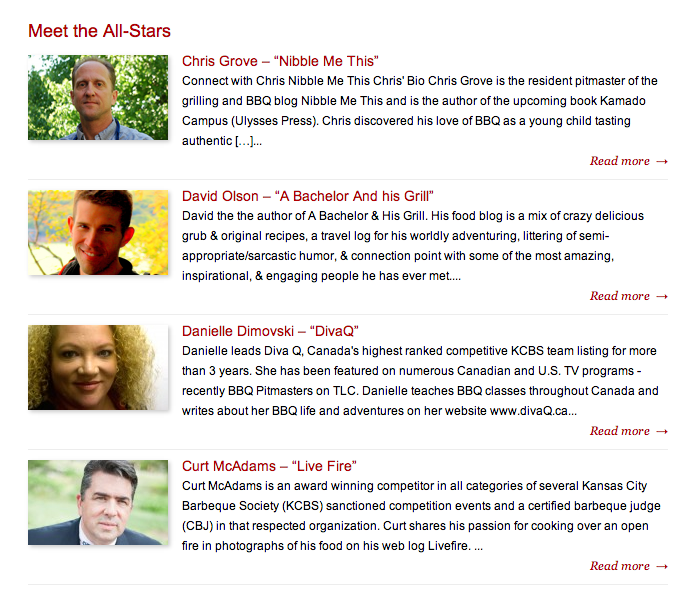 In addition, Char-Broil hosts an annual event with the All-Stars to cook, compare notes, discuss the brand, and check in. Mary says the bloggers really enjoy these events. In fact, the bloggers enjoy each other so much they took it upon themselves to create a closed Facebook page just so they could exchange ideas and cooking tips with each other and Char-Broil’s social media team year round. As a result of their thorough and diligent efforts, Char-Broil has seen a steady increase in traffic and social following every year due to their blogger outreach program. Find a blogger outreach tool that works for you. From InkyBee to GroupHigh (full disclosure: I work for GroupHigh), there is a tool for all company sizes and needs. Determine which bloggers line up with your target audience and start contacting them non-abrasively. Check out this post on SpinSucks about pitching. Love it. Foster your relationships and stay inspired by keeping up with your favorite content marketing/social media bloggers and always seek out campaigns (like this one) to inspire creativity in your strategy. If you’re new to blogger outreach check out this very thorough guide.